The dream. Literally the dream. The sweetest of dreams. One of my fondest childhood memories was building tents with my brother. I’d watch him in awe as he used to explain the best way to put it together and we’d spend hours playing in them. As we grew up and had kids of our own, my brother is still a pro tent creator and me…. well…my vision of tent extraordinaire tends to collapse into a heap before it’s even complete leading to a rather distressed H and an equally frustrated mama who pledged that one day, we’d sleep in something exceptional. And fate obviously took some sort of pity on me because soon after my umpteenth attempt, Muddy Boots Sleepovers entered the equation. 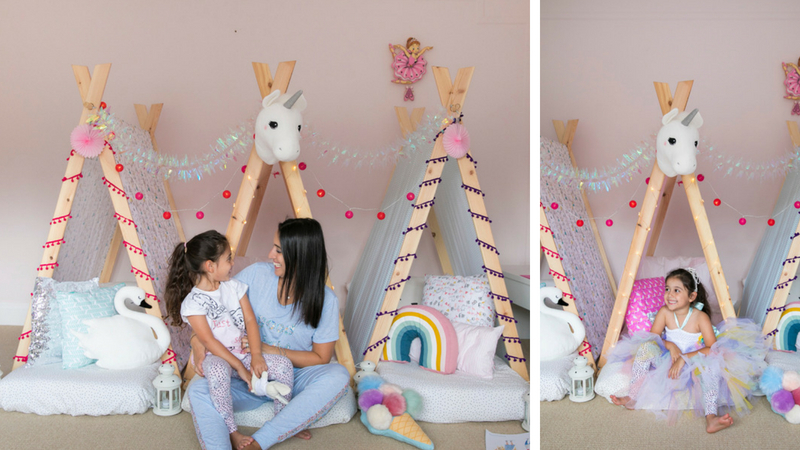 Founder, CJ and her team create the most beautiful themed luxury sleepover parties for boys and girls, aged 4-11, across London and Bristol. Magical doesn’t even do the experience justice. Whilst H didn’t have any friends over for our party, we celebrated the start of the summer holidays in true mummy daughter style and had the most incredible night together. H’s bedroom was transformed in just over an hour into a spectacular space. We were left speechless. 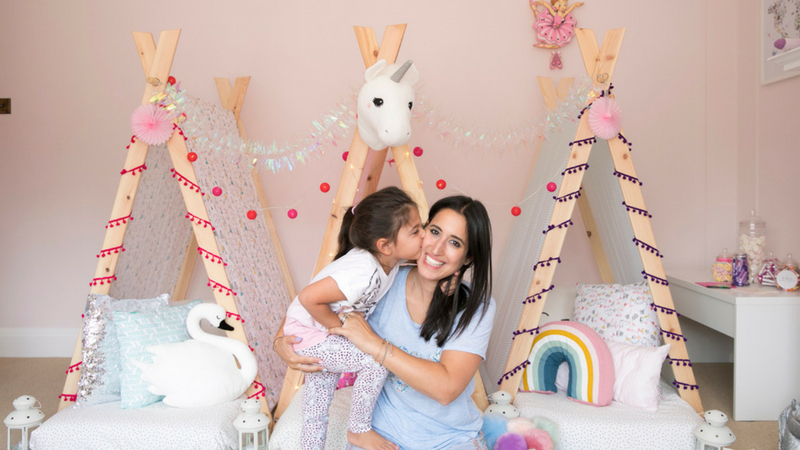 The hand-made teepees were decorated meticulously with twinkling fairy lights, themed garlands and a choice of animal / headdress set upon the top of the party hosts teepee. H went for Louis the unicorn and was exceptionally proud that he was placed over her to protect her whilst she slept. The mattresses inside the teepees were fitted with 100% organic cotton sheets and decorated with beautiful cushions. An individual breakfast tray kitted out with battery operated lanterns, drinking bottles and napkins were placed in front of each teepee. Fancy dress costumes were placed on a hanging rail for H to dress up in as well as a small table of sweet treats (for me ;-)) – H was in heaven trying on each outfit and I was living a childhood dream, watching her in awe living her best life. We spent a few hours chatting, playing and reading in our teepees before I turned the lights out. I treated H to a movie in bed, she chose the Snowman (not too sure why considering it’s the height of summer) and then we fell asleep to classical music. I’ve truly never felt so relaxed. The following morning, we enjoyed breakfast on our trays whilst sitting at the ends of our teepees. We made the most of the couple of hours we had left before CJ was due to come and take everything down. I don’t know who was more upset when our time came to part with the teepees but we’re already planning our next one! H’s birthday *watch this space*. 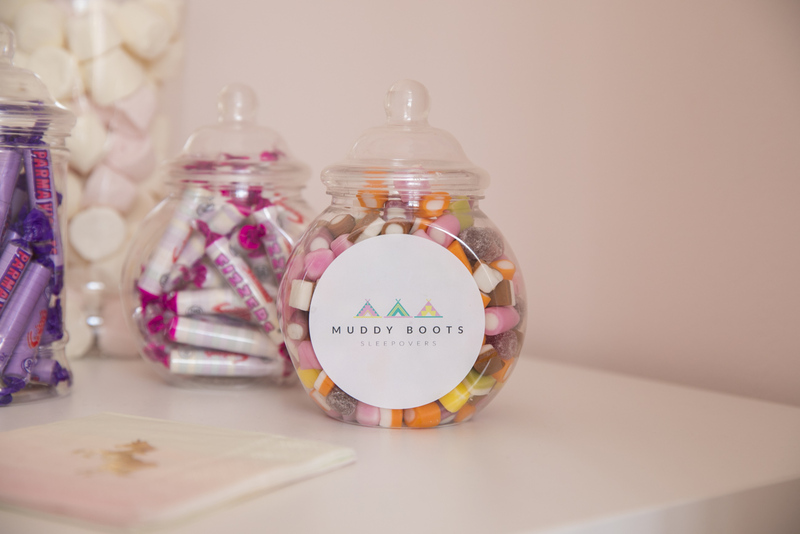 For those looking to host a unique, magical and stunning experience to their children, I cannot recommend Muddy Boots Sleepovers enough. Thank you CJ, we had the most incredible time. Forty Winks – £290 which includes a mini photoshoot, birthday cake and sweet station. 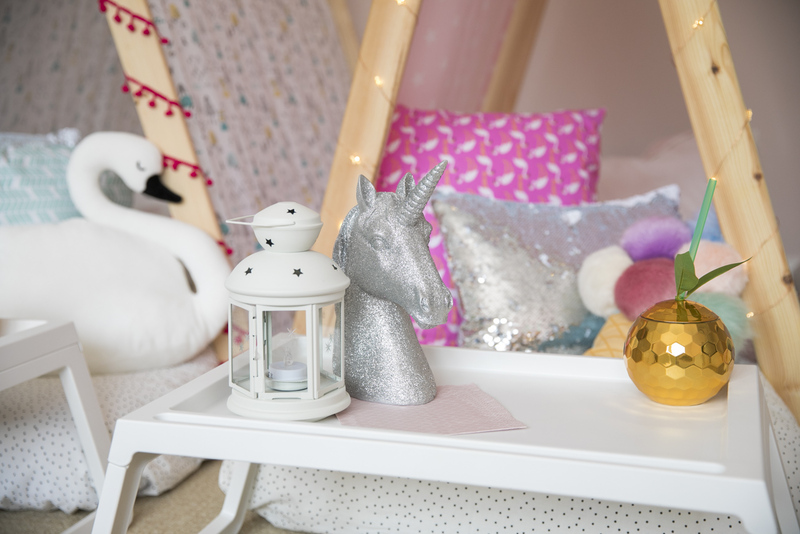 You can currently choose the following themes: Unicorn, Cowboys & Indians, Swan and Mermaid (launching soon). Additional teepees can be requested for a small charge. 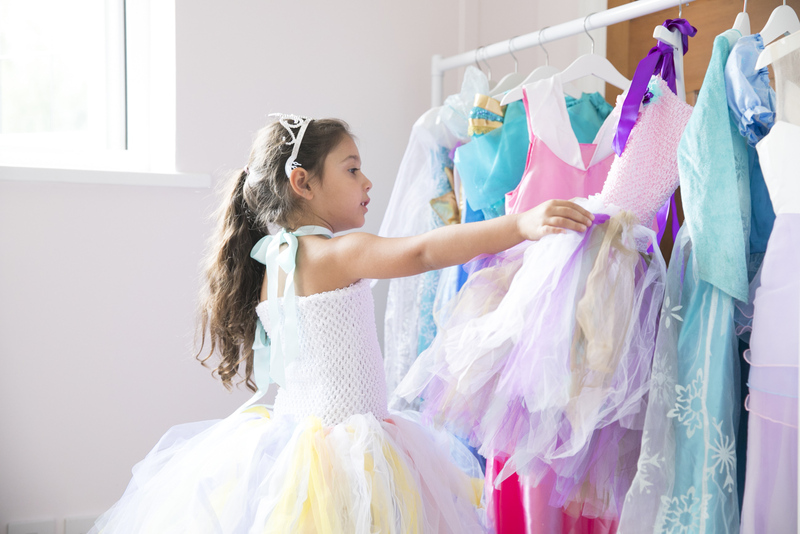 The fancy dress is an optional extra which includes approx 10 costumes and accessories. *I’ve received several messages asking if this setup is available for purchase – please not that it’s not yet but will be soon. For more information and details please click here.